Amanda's specialty is bringing along young horses and creating the confidence and basics that they'll need to succeed in any discipline; however, horses of any age or experience are welcome! Horses in training at Fairwind Stables will receive full board, training on a customized schedule, and regular updates for the owner. 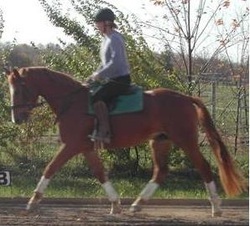 Lessons for the owner are encouraged on horses in training. Limited spots are available to keep the program small enough that each horse gets individualized care. Dulcinea (pictured above) was started under saddle by Amanda and has gone on to be very successful at Second Level dressage with her amateur owner.